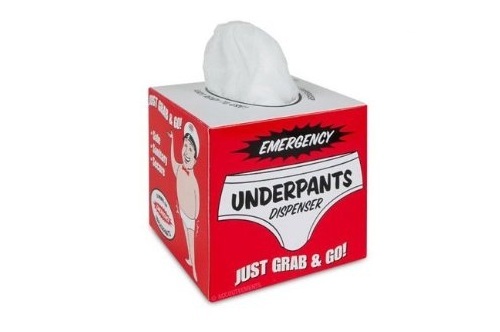 One pair of Emergency Underpants is great, but what if, um, you like, uh, have another emergency? Don't fret, we've got you covered. These 4" (10.2 cm) tall boxes look a lot like tissue boxes, but instead of tissues they dispense underpants. If you want to be extra safe you should keep one by your bedside, one at work and one in the car. Each box contains five pairs of disposable unisex underpants that will fit most adults. Price: $11.12 & eligible for FREE Super Saver Shipping on orders over $25.